A very useful resource for anyone involved in research. 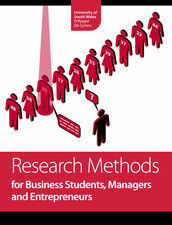 Published by the University of South Wales (USW), Research Methods for Business Students, Managers and Entrepreneurs is a media-rich, Multi-Touch iBooks Textbook, which provides a foundation for research, both for academic study and for practical application in a business environment. Video, audio and image gallery illustrations bring key concepts and examples to life, while a detailed case study runs through the book, following the experiences of a (fictional) student to see how she approaches the challenges and requirements that arise at the different stages of her research project. At selected points in the main text, a reflective activity is introduced to encourage the reader to consider or explore the aspect under discussion.